The client, a New Yorker from Miami who ended up in Nashville, wanted to incorporate a city feel into the identity. The actual restaurant space was small and casual, so we decided to keep the fonts friendly to keep the city skyline look from going to upscale. When an Italian New Yorker from Miami opens a sub shop in Nashville, Tennessee, you know it's going to be an experience. The concept calls for everyone behind the counter to have culinary experience. Customers can walk in and simply say what they're in the mood for, or ask for a surprise, knowing they'll get the finest ingredients and Boar's Head meat. 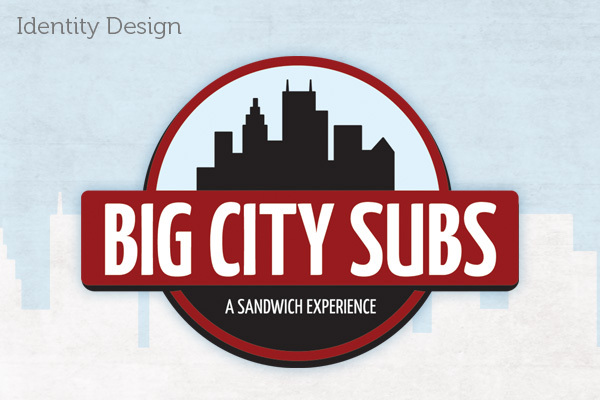 Taking all of this into consideration, we created a city-inspired identity that was fun and casual, and a slogan that communicated "this is not just another sandwich shop - it's an experience!"